Several pear trees have been planted around my house over the years. I can say that every member of my family has their own preferred variety. There is still an antique “butirro” tree variety planted by my grandfather which matures in August. The latest addition to our family, Colleen, also received a pear tree as a wedding gift. It is named “Bella di Giugno” or “Beauty of June” because it matures in the month of June. With this availability of raw material, it was easy to look for recipes that have this fruit as the protagonist. 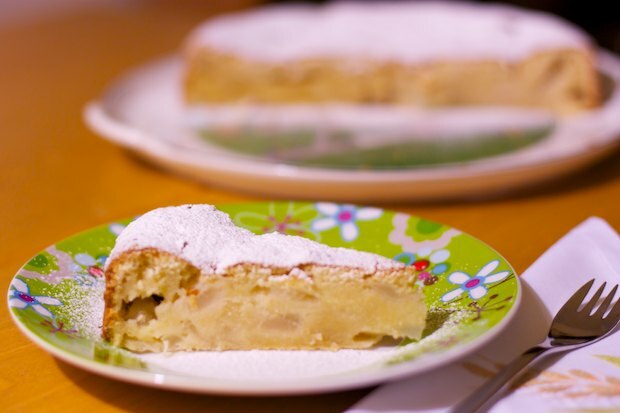 The cake in this recipe is very soft because of the juice that the soaked pears give off when cooked. It is a French recipe and takes its name from the region where it was invented: “Gargouillau”. Remove the butter from refrigerator and place it in a bowl to soften. Peel the pears and cut into very thin slices. Working with the butter that has been softened at room temperature, add the sugar, grated lemon zest, and a pinch of salt. When the mixture is creamy, add the eggs (one at a time), flour and yeast or baking powder. Pour the pears into the mixture and stir gently. Pour the mixture into the pan and bake at 350°F for 45 minutes. After 45 minutes pierce the cake with a skewer, if the skewer comes out clean, the cake is ready, otherwise continue cooking for another 10 minutes. When the cake is cool, sprinkle it with powdered sugar and serve. Posted in Dessert and tagged with Soft Pear Cake, Torta Morbida di Pere. RSS 2.0 feed. Oggi mia figlia Francesca ci ha preparato la torta Morbida di Pere. Voto: 10 e lode a te e a lei. ciao sono sergio il figlio di Chiara (Toneatto, l’amica di tua sorella) e uso spesso le tue ricette… perchè hai scritto “accendete il forno a 200°” se poi la torta viene cotta a 180°? In genere, utlizzo sempre una temperatura superiore per scaldare il forno, poi al momento di introdurre il dolce abbasso il termostato alla temperatura adatta per la ricetta. Molto dipende dal tipo di pere che hai utilizzato. Se non sono molto succose può capitare il problema che tu hai avuto. Aggiungere un pò di latte è la cosa migliore. Spero che tu provi ancora altre ricette. Buon Anno!